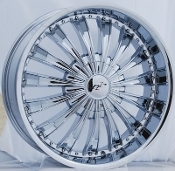 When ordering, select the desired wheel size. In the ordering notes, state the year/make/model of your vehicle and the appropriate offset will be shipped. Staggered wheels will be documented stating front and rear sizes. You will be contacted prior to shipping if the order has to be changed.